Although the description so far offered of Hutchins's work as a scientist has introduced a number of collaborations, she has engaged in many more projects with engineers and scientists in the United States and abroad. She began to see the need for these collaborations as early as the 1950s, when she discovered that violin acoustics was a field where persons worked in isolation. Hutchins began her long career of bringing together specialists in related fields, often formulating the questions for study and demonstrating their relationship to the physics of the violin. The uniqueness of this has been pulling together music and physics people at these different stops, and then letting them see that there is something very creative to it, and they get excited. What follows are brief descriptions of some of Hutchins's more satisfying relationships and collaborations with scientists and engineers, many of which were made possible by Hutchins formulating technical questions about the physics of violins and then seeking a person with the special expertise to help solve that problem. Arthur H. Benade (1925-1987), author of Horns, Strings, and Harmony and Fundamentals of Musical Acoustics, was one of the most prominent physicists associated with musical acoustics. An early supporter of Hutchins, he was a charter member of the CAS and published thirteen articles in the Journal between 1965 and 1986. [FN 100] He once told Hutchins: "Hutchie, you know, you are the best acoustician in the world who never had any formal training," and also praised her in print as "...a skillful instrument maker in the conventional sense as well as an expert in musical acoustics..." who has encouraged others to combine the best building techniques with sound acoustical theory. [FN 101] In 1964 Benade helped to legitimize Hutchins's claim that the violin octet was a projection of the sound of the violin into other registers by comparing the tone of members of the octet with "...the tone of a good conventional violin that had been tape-recorded and played back at altered speed in order to transpose its sounds to the pitch ranges of the various new instruments." His conclusion from tests verified Hutchins's feelings about the octet: "The final tape put together from our recordings had a pleasant sound but, far more interesting, it is easy to recognize that the tonal characteristics of the various instruments are present in the transposed sound of the ordinary violin. "[FN 102] Hutchins and Benade also met at numerous professional and scientific meetings and served each other as valuable testing grounds for ideas. Another charter member of the CAS was Eugen Skudrzyk, a prominent physicist and acoustician who taught at Pennsylvania State University and wrote The Foundations of Acoustics. Skudrzyk was most knowledgeable in the area of vibrations analysis and his father had done some violin research in Germany. Skudrzyk invited Hutchins to lecture at Penn State three times and they worked together on analysis of woods. Hutchins has found some of Skudrzyk's ideas very helpful, especially that low frequencies, in some contexts, reflect high frequencies, meaning that one can make changes to improve the lower range of a violin and help the higher range at the same time. In the 1960s Earle L. Kent was director of research at the Conn Instrument Company and he later wrote Musical Acoustics, Piano and Wind Instruments. He offered Hutchins useful advice on occasion, like convincing her of the folly of patenting her method of plate tuning. In the mid- 1960s he represented Conn in attempts to mass-produce alto violins through the German violin company of Heinrich Roth (for which Conn was the American distributor) with Hutchins doing the plate tuning and in working out a research partnership between Conn and Hutchins. Although neither of these efforts bore fruit, Kent was a strong supporter of Hutchins's work. 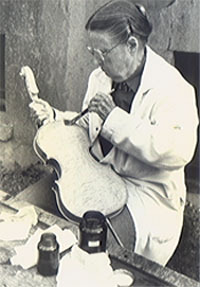 One of Hutchins's early students in violin-making was George Bissinger, later a professor of physics at East Carolina University. After becoming a full-time physicist, Bissinger desired to continue his work with violins and collaborated with Hutchins on several projects, the results of which were published in the CAS Journal between 1976 and 1988. [FN 103] In one of their projects, Hutchins and Bissinger studied the relationship between wood and air modes in the violin. They filled violins with heavier-than-air gasses like carbon dioxide or freon and measured differences in sound. These gasses move the air modes down in frequency, showing how a change in the air modes with constant wood modes changes the sound of the instrument. In order to shorten his commute for this research, Bissinger recently has worked with Robert and Deena Spear in Maryland, two more Hutchins students. Rex Thompson is an Australian chemist who came to work with Hutchins in Montclair as a Churchill Fellow for a month in the early 1970s, taking a pair of tuned violin plates home with him. Thompson's interest was the effect of moisture on violin plates, and he demonstrated that the top and bottom plates of the same instrument should be tuned at the same time in about 50 percent relative humidity. [FN 104] Hutchins has continued to work with Thompson on varnish formulas. He is one of a number of Australians active in the CAS. Daniel W. Haines, a mechanical engineer and now professor of engineering at Manhattanville College in Riverdale, New York, has been associated with Hutchins for over twenty years. Much of Haines's work has been research on the guitar, including the development of an experimental graphite-epoxy composite for guitar tops. Between 1971 and 1974 he worked with Hutchins and others on the use of this material in violin tops. They established that it had the acoustical characteristics of fine spruce, but the material was very hard on human skin, so their work stopped after the building of a prototype. [FN 105] Haines has remained active in the CAS, serving as editor-in-chief of the Journal since 1989. Hutchins has worked with several German scientists. Lothar Cremer, one of Germany's leading acousticians, corresponded with Hutchins, and met her at meetings, and invited her to lecture to his students at the Heinrich Hertz Institute. He published seven articles in the CAS journal between 1972 and 1989. [FN 106] Cremer and Hutchins co-directed a CAS Technical Conference in Mittenwald, Germany in 1974, bringing Hutchins's work to the center of the German violin-making industry. An acoustician who helped to run the meeting was Helmut Muller, a consulting acoustician, who also worked with Karl Roy, head of the Mittenwald school for violin-makers. Hutchins has had the opportunity to demonstrate plate tuning to Muller on several occasions and he is now fostering interest in the technique at Mittenwald. At the International Symposium of Musical Acoustics in Mittenwald in 1989, organized by Muller, at which Cremer, Muller, Hutchins and other scientists spoke, Muller joined with Martin Schleske in a paper that asked "Is Scientific Research Useful for Violin Makers? "[FN 107] They made several suggestions on how results of research could be made more accessible, a subject important to Hutchins as well. She also worked for several years with Professor Werner Lottermoser and his associate Jurgen Meyer of the Physicalische Technische Bundensanstalt in Brunchweig comparing test methods and results on an instrument they sent to her. Lottermoser has now retired, but Hutchins still works with Meyer, who is well known in the acoustics of music instruments. Another German scientist with whom Hutchins has worked is Heinrich Dunnwald, who studies the traits of the old Italian instruments and tries to reproduce them in newer instruments. [FN 108] Hutchins has sent him Sus 260, a violin. Dunnwald is making some changes on the outside of the instrument, and then Hutchins will work on the inside. Hutchins is concerned that his work will lower the Delta so much that the tone improvement will not be sustainable. A major center for the study of musical acoustics is the Department of Speech Communications and Music Acoustics of the Royal Institute of Technology in Stockholm. A leading physicist and acoustician there is Erik V. Jansson, who earned his doctorate at Case Western University with Benade. Jansson has worked on a number of aspects of the physics of the violin. Some of his latest research concerns the prediction of what wood in rough form might make good violin plates. Furthermore, he experiments with the resonance of a simplified violin body, experiments not unlike ones that Saunders and Hutchins did in the 1950s. [FN 109] Hutchins and Jansson worked on what they called a "plateric" study. She sent him ten tops and backs of violins which Jansson assembled in various combinations to measure what kinds of instruments they produced. Hutchins found Jansson's data difficult to interpret, but his main argument was that the best instruments had their peak sounds at frequencies in predictable relationships. One of Jansson's graduate students, Jesus Alonso Moral, also worked on this project, spending time with Hutchins in Montclair in the early 1980s. [FN 110] Another student at the institute with whom Hutchins has worked is Anders Askenfelt. In 1982 Hutchins offered a three-month workshop in violin acoustics in Montclair with Moral and Australian Graham Caldersmith, who was in the United States on a Churchill Fellowship. Stockholm has had other associations with Hutchins as well: one of the octets was purchased by the Royal Academy of Music and is in the permanent collection of the Musik Museet. She attended meetings of the Stockholm International Music Acoustics Conference in the summer of 1983 and again in 1993 where there were demonstration concerts for the octet. Hutchins published a second article in Scientific American, "Acoustics of Violin Plates," in October 1981. [FN 111] A few weeks later she was called by Kenneth D. Marshall of the B.F. Goodyear Research & Development Center about modal analysis of violins. Hutchins sent him three violins-- Sus 181, 295, and 297--for analysis, with Sus 181 in pieces. He has published a major article in the Journal of the Acoustical Society of America and three articles and two abstracts in the CAS journal, including the lengthy "Modal Analysis: A Primer on Theory and Practice," an important introduction to the field for novices. [FN 112] Study of the modes of resonance of violin plates has been central to the Hutchins's work throughout her career, and Marshall is a researcher who has built on her work in the area. An experiment which proves Hutchins's willingness to put her skills as a luthier at the service of science is the so-called "Swiss cheese violin," built in the early 1980s at the suggestion of Edgar A. G. Shaw, a leading Canadian acoustician. Air modes and wood modes in a violin interact with each other; it was Shaw's suggestion that by drilling holes in the ribs of a violin that the air modes would be changed without changing the wood modes, providing an opportunity to study their relationships not unlike the heavier-than-air experiments with Bissinger. Hutchins and Schelleng had tried to provide the same effect by stuffing a violin with knitting wool, but that changed the wood modes as well. Hutchins gamely drilled 65 holes in the ribs (the first was the hardest, she notes!) of one of her unvarnished violins (the number and positions of the holes suggested by Benade), and began to experiment with playing the violin while the holes were open, plugged with sponge, or plugged with cork. With all of the holes opened the air modes rose about 50 Hz, practically eliminating their reinforcement of lower wood modes. The lower range of the instrument became quite weak and the upper range very strong, graphic demonstration of the important relationship between the air and wood modes. [FN 113] I have heard this instrument played with the holes open. The violinist tried to produce an even tone throughout the range, but it was exceedingly difficult. when all of the holes are plugged with cork, the normal relationship between the air and wood modes is restored and the violin has the expected tone. Max Mathews, a former laboratory director at Bell Labs in Murray Hill, New Jersey, is another engineer with whom Hutchins has worked. His work in violin acoustics has included the design an electronic violin and work on the bowed string, projects on which he has reported in the CAS Journal. [FN 114] Hutchins was a consultant for Mathews's design of an electronic violin in the late 1960s, helping with the instrument's tone quality and how that quality can be measured. Mathews's instrument consists of a frame with steel strings stretched across it, playable by a conventional violinist. The sound of the instrument, produced electronically, was based upon Hutchins's understanding of a violin's tone. Mathews has also built an electronic viola and cello. In more recent years Mathews has been a professor in musical acoustics at Stanford University, where he has been an important figure in establishing the CAS archive. The engineer with whom Hutchins has worked with the most over the last fourteen years is Oliver Rodgers, retired from Scott Paper. [FN 115] Rodgers played chamber music with Saunders while a Harvard undergraduate, and was always interested in the technical side of the violin. He first came to Hutchins in 1979 to watch the shop work, but was drawn to the study of violin-making, and soon began to work with her in scientific areas. Rodgers has discovered that Hutchins has a gift for getting persons ever more involved in her work: at one point he made a drawing of a viola he wanted, and soon found himself preparing drawings for the octet. He describes Hutchins as a "bulldog," a pragmatic experimenter always working on two or three different theories, and a researcher not afraid to contradict herself in print after further research. Rodger's most significant contribution is an ongoing attempt to make a computer model of the entire violin while working as an adjunct professor at the University of Delaware since 1984. He wanted to learn a finite elements analysis program and found the violin to be an ideal, if complicated, introduction. He started with a Stradivarius completely described by Sacconi,[FN 116] but over the years he has changed the description of the instrument in the computer. His modelling of the top-first flat and then arched--has allowed him to transfer Hutchins's knowledge of plate tuning to the computer. Rodgers has tuned 3000 to 4000 plates on the computer, discovering especially sensitive places where wood should be removed. The project is extremely complex. The Vax computer on which Rodgers first worked took two hours of central processing time to tune a plate; in the process the computer solved 8000 algebraic equations. [FN 117] Rodgers has become very active in the CAS and sees his collaboration with Hutchins becoming even closer in the future. Wilfred Cote, professor at Syracuse University, has worked extensively on the microstructure of wood. He has provided Hutchins with photographs of wood at a microscopic level, and has indicated that when wood is vibrated under stress by sound waves, like a violin being played, the long-chain polymers in the wood break. With changes in temperature and humidity, however, the polymers repair themselves. This is what happens in the process of "playing in" a violin so that it responds more easily. When it is left unplayed for a period of time, the chains tend to repair themselves, but not entirely. Violinists recognize this as an instrument left idle for a few months that needs to be "played in" again. Hutchins has shown this experimentally by vibrating a number of violins continuously for 1500 hours, causing the B1 body vibration to decrease some 25 Hz, making the instruments easier to play and "more friendly." When allowed to rest for three months the B1 body vibration goes back up about 15 Hz, but not all the way. Young Nam Kim, an expert in fluid dynamics, works on air flow through jet engines for Pratt-Whitney in Hartford. He became interested in air flow around the f-holes in violins, and went to Montclair several times to work with Hutchins during the winter of 1992 and 1993. It is Kim's intention to model the flow of this air on computer. No respect for authority; a long attention span; scrupulous honesty; enthusiasm for intellectual collaboration; and the willingness to spend a lifetime beating a path through the jungle. When I think of Carleen Hutchins in terms of those criteria, anything to do with any other kind of credentials fades instantly into insignificance. Accordingly as I open our special session on "Bowed Strings--Honoring Carleen Hutchins," I feel honored and privileged to bestow, in my name and that of my colleagues, the title of "Honorary Research Scientist" on this gracious lady.